Who doesn't love a week of vacation from work!? Well, when that week consists of moving, unpacking and working on a thesis paper, the number of people loving a vacation week might drop a bit. I'm certainly enjoying it though. It's nice to be able to get settled and start putting a dent in my research for my paper. I'm trying to utilize every second of this "vacation". 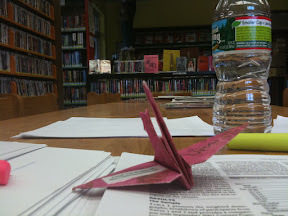 So this crane was left at the library where I did a bit of my research reading. And it also kicks off the beginning of some more crane placements in my new area! Be on the look out for some new updates to the website (in time!) and a lot more crane placements. I've also got my next big trip planned for the beginning of June to Disney World! So lots of exciting things on the horizon. Stay tuned! I can't wait to see what you have in store for Disney! As a crane maker myself might I suggest after making each one blow through the hole in the bottom or tug the wings gently, the your crane will have a box as a body and you can stand it up! Great work! I love this! Where you inspired by Sadako's story? 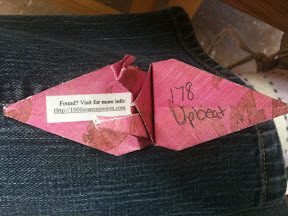 That's what got me making cranes! What a wonderful and inspiring project! wonder what "mirth" looks like! Keep up the great work x looking forward to disney postings !! What a great project! Would you like to distribute some in Australia? Any chance you can drive down to West Palm Beach during your Disney trip and drop off a few cranes?! I LOOOOVE this project! This is really great, wonderful, inspiring idea. You left a comment on my 20sb profile a while ago that I JUST saw which was very sweet. Because you enjoyed studying abroad so much, you might enjoy my new website www.filleamericaine.com. I only hope to think of as inspiring ideas as you!